Just loving the slightly cooler weather right now (and I realize that in Dallas, slightly cooler means not 100, but I'll take what I can get)! We did absolutely identical bentos today, to make things easy on me. I like things to be easy for me and I had just enough of everything to not have to add in extras for somebody! We used two tier bentos today. The bottom tier holds a sandwich pocket (new kind, Honey Grain, forget the brand name) stuffed with ham, cheddar and herb & chive cream cheese. I did have to take a teeny bit out of the corners so they fit in the box. 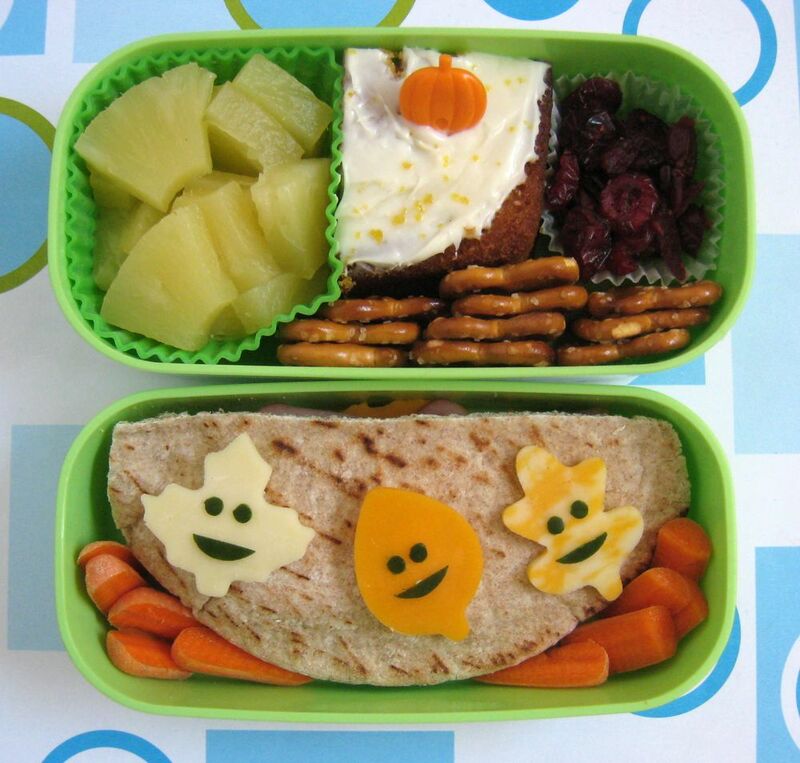 The sandwich is decorated with some happy falling leaves of assorted cheese with cucumber faces, and a few baby carrots help hold it in place. Quick trick--tiny dots of cream cheese, tip of a toothpick sized, help hold decorations in place! The top tier has slices pineapple, the last of the pumpkin cake, some pretzels and some dried cran-cherries (State Fair samples yesterday).